Most homes are noisy and activity-filled with holiday guests and family members. The holiday season puts stress on everyone, including pets. A new kitten in the home requires an owner's time and attention in order to form the necessary emotional bond that will last a life time. It is oftentimes a stressful time when a kitten first comes into a new home. The new home has new smells, different activity level and noises, a different place for their food and water dishes, bed and litter box, etc. It is always advisable to let a new kitten settle into a new home for a week or so without major distractions before introducing it to extended family and friends (i.e., holiday guests and friends). While a kitten buyer may think their friend, child or spouse loves cats, owning a pet is an emotional bond between that owner and pet. When a pet is given as a gift, there is no emotional connection between them. Most often when a person decides to add a pet to their life, they will spend time looking for one until their heart says they have "found the one" for them. 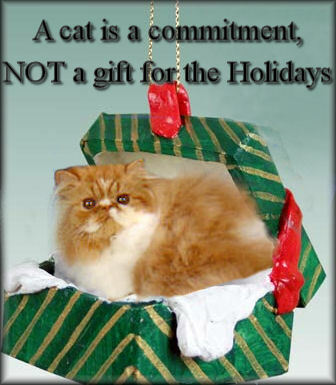 A cat is a commitment not a gift! Pet ownership involves a life-long commitment of time and personal resources. While a surprise gift of a kitten might initially overjoy the recipient, they may be unprepared for the lifelong commitment. 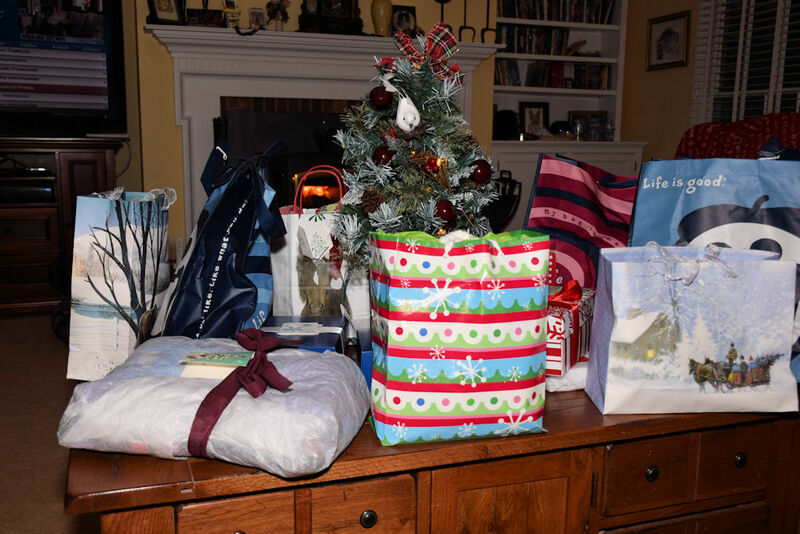 We have all seen young children thrilled with the new puppy or kitten they received for Christmas, but the novelty quickly wears off and before Christmas break is over the child is interested in something else. The necessary daily grooming of a Persian kitten is something that some cat owners do not want to deal with, and the kitten will suffer for it. Even if the kitten has its first round or two of vaccinations, there is still a financial responsibility to maintain the pet's health over a lifetime including food, litter pans, cat litter, toys, scratching post and cat trees, and veterinary care. Veterinary care (without taking into consideration any catastrophic health problems) will cost approximately $100 - $300 per year. Preventive and consistent care is vitally important to a pet's overall health. Additionally, it may cost anywhere from $70 - $300 to get kitten spay or neutered. Also, if the pet is a Persian cat, there may be a financial cost for grooming and bathing if the new owner is unable to do this themselves. Surprising someone that may be financially unable to care for the kitten is not fair to the person or the animal. Most people who contemplate getting a pet spend time with advance preparation for that pet. Advance preparation may include pet-proofing the home, buying food and water dishes, litter box and litter, grooming supplies, bedding, food and more. When one receives a pet as a surprise gift, there is no time for advance preparation, and the pet and new owner suffer for it. Living with a pet creates a change in lifestyle. A person that lives alone may prefer that and not want the responsibility of caring for an animal as a pet depends on its owner for food, water, healthcare, safety, and companionship. People often make the mistake of thinking a cat would be a great gift because of the impression that cats are low maintenance compared to dogs. A cat does not require obedience training, housebreaking, or daily walks. However, cats thrive in homes where there is a consistent routine and interaction with their owners. If you want to help someone find the purrfect match for them, wait until the holidays are over. Once the holidays are over, you can take your time helping them with the preparation and any necessary education of the care required for that particular breed or species of pet. Let the potential recipient of the kitten decide whether a kitten is what they want BEFORE getting them one.